The Americans with Disabilities Act (ADA) is the widest-ranging and most comprehensive piece of civil rights legislation ever passed in the United States, and it has become the model for disability-based laws around the world. Yet the surprising story behind how the bill came to be is little known. From inside the offices of newly formed disability groups to secret breakfast meetings surreptitiously held outside the White House grounds, here we meet countless unsung characters, including political heavyweights and disability advocates on the front lines. “You want to fight?” an angered Ted Kennedy would shout in an upstairs room at the Capitol while negotiating the final details of the ADA. Congressman Tony Coelho, whose parents once thought him to be possessed by the devil because of his epilepsy, later became the bill’s primary sponsor. There’s Justin Dart, adorned in disability power buttons and his signature cowboy hat, who took to the road canvassing fifty states, and people like Patrisha Wright, also known as “The General,” Arlene Myerson or “the brains,” “architect” Bob Funk, and visionary Mary Lou Breslin, who left the hippie highlands of the West to pursue equal rights in the marble halls of DC. 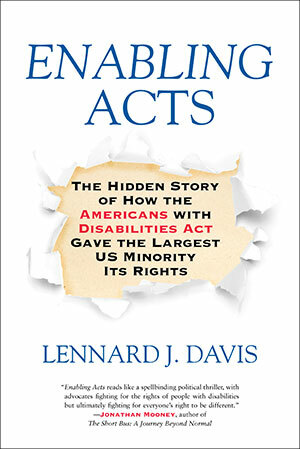 Published for the twenty-fifth anniversary of the ADA, Enabling Acts promises to ignite readers in a discussion of disability rights by documenting this “eyes on the prize” moment for tens of millions of American citizens.